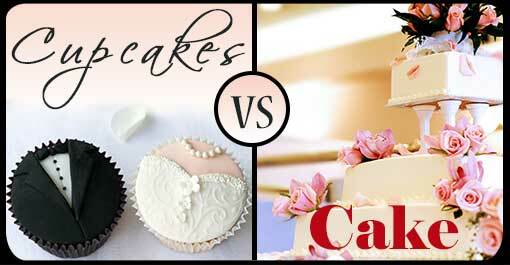 Wedding Cake Vs. Wedding Cupcakes—Which Should You Choose? There is nothing sweeter than your wedding day, except maybe the dessert! Which little slice of heaven should you serve up? The top two dessert front runners at today’s weddings are the traditional wedding cake and the modern cupcake. Read on to learn which tasty treat will best complement the kind of celebration you are hosting. Cake is to be served if you are having a traditional wedding. A traditional wedding by definition means having a reception that is held during the late afternoon or early evening on a Saturday, in a formal venue. These traditional cakes are usually designed in a round or square shape and is arranged in layers. An average wedding cake serves 150 guests. If you are having a smaller wedding that is still deemed traditional, considering telling your baker to whip up a small sheet cake. Cakes also offer more space than cupcakes to add embellishments like flowers, berries, bows, and any other item that reflects your wedding theme if you choose one. Couples also like the traditional wedding cake because they are able to place a cake topper on top and freeze the entire top layer and enjoy it on their one year anniversary. A cake also allows a couple to slice the first piece together, hand over hand; in a cake cutting ceremony. 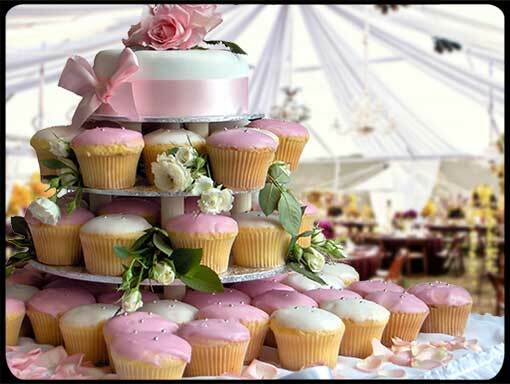 Cupcakes are to be served if you are having a casual wedding. A casual wedding by definition means having a reception that is on a Saturday or Sunday around brunch time that is held in a non-formal venue. Beach weddings, garden parties, and barbecue receptions are fun but are a lot less formal than a traditional, sit down dinner. Cupcakes are fun and can capture a couple’s playful personality. Serving them shows that a couple is unafraid to conform to the “norm” and they can still be decorated and embellished to complement any wedding theme. Cupcakes are great to serve if the couple is on a budget and can even be made ahead of time by the bride to be (or another willing family member). Whether you serve up a slice of cake or a cute cupcake; one thing’s for sure. Either will taste great to your guests. However, consider some of the facts above to help you decide which will best complement the wedding you are hosting and your wants and needs as a couple. And, if you still can’t decide, compromise is a beautiful way to begin a marriage. What’s the Standard? Do You Get the Leftover Food From the Cocktail and Wedding Reception? Saying “I do” is actually the easiest part when tying the knot. What’s complicated are all the technicalities of wedding etiquette and the tedious (and sometimes stressful) planning process from start to finish. One area brides-to-be should really focus on is the food. Not only do you want to feed your guests, you want to ensure they don’t leave your reception hungry and disgruntled. Read on to learn about what’s standard when it comes to leftover food from your cocktail hour and your wedding reception; helping you make sure that every guest has enough and you get full use of your funds! Cocktail hours vary. Some couples who are on a budget opt to serve strictly cheese and crackers, or they will host a room full of buffet style snacks. Others, sparing no expense will have 25 butlers serving dainty hors d’oeuvres with white gloves. The bottom line is all food should be passed out for guests to enjoy. Don’t try to hoard the extras! The cocktail hour truly makes the first impression of your event, so don’t hold back. If you are worried you and your partner won’t get to enjoy the food, be sure to ask your wedding coordinator to have the help serve you first, or set aside a large plate that you can enjoy when you are ready. 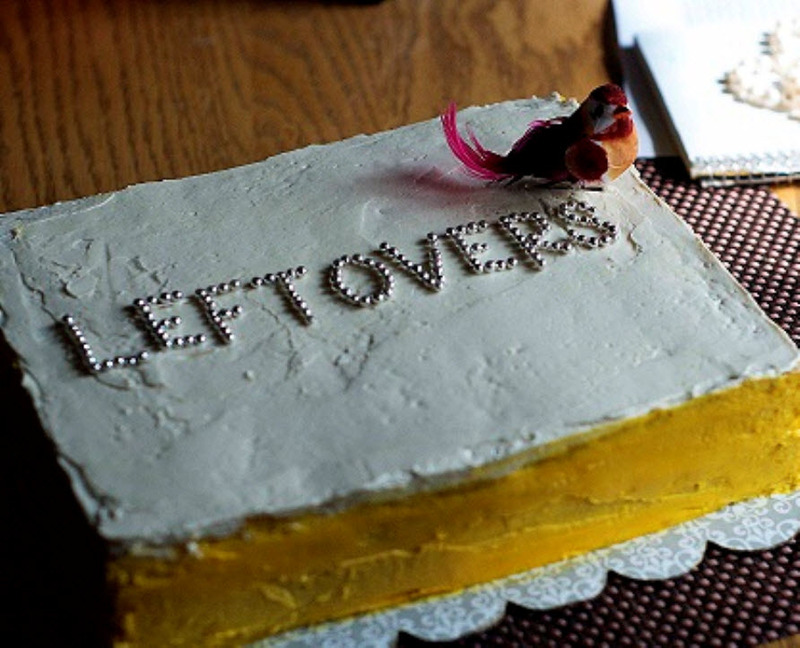 When it comes to leftover food from your reception, you have one of two choices that are socially (and financially) acceptable. You can opt to send servers back out after everyone is served and stop by each table, offering seconds. You can even direct the staff to cut entrées into smaller portions when offering seconds to help you be sure you have enough for everyone who may want more. Or, you can simply package the left overs and take them home to freeze or eat with friends and family for a post-wedding dinner. Either way, you have paid a lot of money for your food and should never allow it to go to waste. 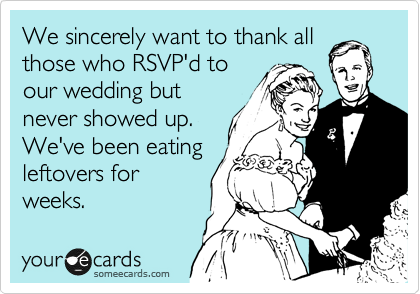 Wedding venues always prepare extra food as a courtesy and there are always a few guests who RSVP and do not show up, so be sure to take their food home or pass out their share! Both options are classy and everyone will appreciate your good taste. It’s good to know wedding food etiquette prior to your big day, so guests can be fed and full and you can maximize your expense! What do you think? Do tell! How Far in Advance Should You Send Out the Wedding Invitations? When it comes to sending out save-the-date cards and wedding invitations, there are a surprising number of opinions on the subject. Some wedding experts claim that you shouldn’t send out the wedding invitations too far in advance, as giving people too much time to RSVP will make them more likely to forget. On the other hand, there are some wedding gurus who insist that you should send out the invites far enough in advance that your out-of-town guests have enough time to make travel arrangements. Given all the differing opinions, it becomes clear that one question remains: how far in advance should you send out the save-the-date cards and wedding invitations? These days, destination weddings and weekend-long affairs are becoming more common. If you’re planning on throwing a wedding that requires a long weekend or want your loved ones to travel to a special location for your ceremony, you’ll want to send out the save-the-date card (along with the location) as early as possible. The further away the wedding destination, the more time you’ll want to give your guests to save up money, make accommodation arrangements, and book flights. The same rule of thumb applies if your wedding is on a holiday. For example, if your wedding is over the Fourth of July weekend, you’ll want to give your guests enough time to make specific travel arrangements. When’s an Appropriate Time to Send a Wedding Invitation? 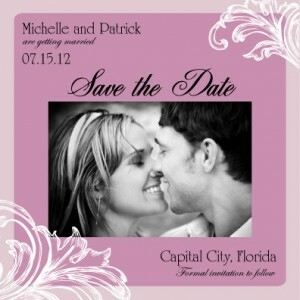 Save-the-dates cards are generally sent out as soon as you book the location of your wedding ceremony and reception. However, if your wedding is some time away, wedding experts indicate that it’s best to send save-the-dates cards at least six months in advance (closer to a year if you’re requiring a lot of travel for your guests). Now that your loved ones are alerted as to the date of your wedding, you might be wondering when it’s the best time to send a wedding invitation. Wedding gurus agree that sending wedding invitations at least three months in advance is the most appropriate time. Do I Have to Send a Save-The-Date Card? If your wedding ceremony is only a few months away, sending a save-the-date card is pretty much akin to sending a wedding invitation at this point. As a general rule of thumb, if your wedding is less than six months away, it’s best to forgo the save-the-date for a traditional wedding invitation. When you’re ready to let your loved ones know where and when you and your honey are tying the knot, visit SaveTheDateForLess.com to discover beautiful invitations and fun save-the-date cards! Don’t forget to ‘like’ us on Facebook to receive a 20% off coupon code for any future order. Hurry offers ends July 31, 2012!